Schedule is subject to change without notice — stay tuned for future appearances! 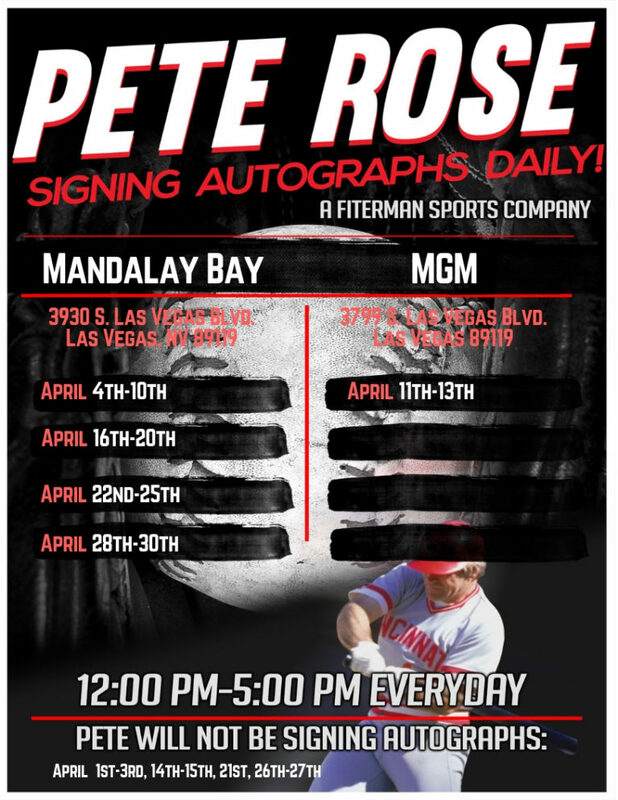 Pete Rose will be signing autographs daily from 12-5pm at the Art of Music stores in either Mandalay Bay, or MGM Grand. Below is the schedule of where Pete will be. February 16th – MGM Grand. February 17th – MGM Grand. February 18th – Mandalay Bay. February 21st – Mandalay Bay. February 22nd – Mandalay Bay. February 23rd – Mandalay Bay. February 24th – Mandalay Bay. February 25th – Mandalay Bay. February 28th – Mandalay Bay. For details call 702-308-8120 and ask for Belinda. February 19th – Mandalay Bay.